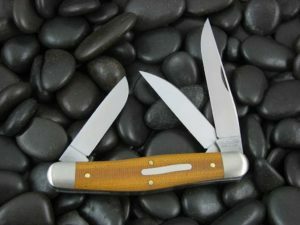 This is the Great Eastern Cutlery Tidioute Oregon Trapper Hunter, has Natural Canvas Micarta handles and Brass liners. The blade steel is 1095 and finish is Satin. I love this knife but i had to work for it. The action out of tube was pretty gritty, a quick oil flush took care of that. Noticed some blade wrapping the first week of carry, a sharpening took care if that. The size is perfect for my xl glove hands. The large lanyard hole helps retrieval from the large CK slip i purchased with the knife. I’ve had it going on three weeks and there hasn’t been a day that it wasn’t with me. I’ve been contemplating on purchasing another just as a replacement and have been fawning over the other scale options in the same model. Of the three Oregon Trappers I have purchased (frontier bone, beavertail and natural canvas micarta) this one is my favorite. The fit and finish if not perfect is as close to perfection as possible. This example also has the best walk and talk of the three. I do like the lighter pull (not a nail breaker like some other GECs I own). Another plus is that the blade is pinchable. As usual the service and speedy shipping from CK is outstanding! 5 out of 5	Amazing piece! 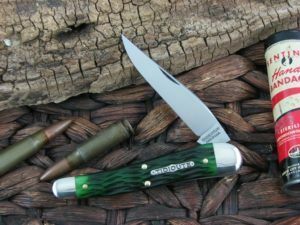 Nice and big… an everyday knife that will be a great choice for almost any task. Came very sharp and the fit and finish was perfect. 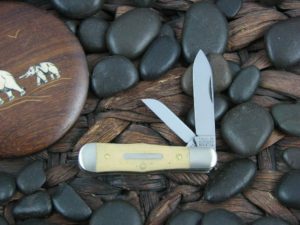 The 43 Trapper Hunter seems like a bit of a departure for GEC. 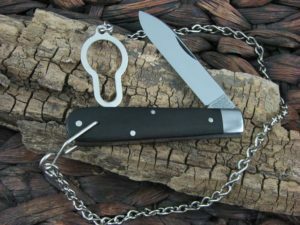 Not only is it a “full-size” knife but the back spring seems noticeably weaker relative to smaller GEC’s, probably due to the proportionately larger size of the blade. That’s not necessarily a demerit – the very nice clip point opens smoothly up to and past the half-stop. I agree with Mike’s assessment of a “5” for the pull, but it feels a little lighter because of the large-size blade. Overall, a handsome and very competent user. The canvas micarta is a great material choice for this one, in my opinion.